Free Radio Show: contains information of such importance to the safety of the general public, that the archive – which is USUALLY for Subscribers only – is being made available to the public FREE. To hear the show, click this link to go to Hals page, scroll to the bottom of page, click the PLAY button on the player. The downing of Indian and Pakistani planes has prompted the world to brace for a potential further escalation of an air conflict between the two arch-rivals. A military analyst elaborates on what options they have. One of the world’s most numerous fixed-wing aircraft in current military service. RT has asked a retired colonel and a military analyst, Mikhail Khodarenok, what else the two old foes might have up their sleeves in case of a full-scale aerial combat. which was developed in the late 1970s to counter US fighter jets such as F-15 and F-16, Khodarenok said. Initially designed as an air superiority fighter, MiG-29 was later furnished as a multirole aircraft that can be equipped with a range of air-to-air and air-to-surface armaments and precision munitions. Another of India’s option involves Su-30MKI – a twinjet multirole air superiority fighter developed by Russia’s Sukhoi in late 1990s and introduced only in 2002. Produced locally by the Hindustan Aeronautics Limited (HAL), it is one of India’s most modern military planes, which characteristics are close to those of Russia’s Su-35, distinguished by its high maneuverability. 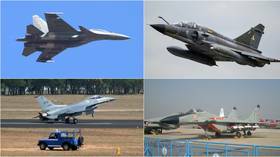 Additionally, New Delhi might rely on its French-made Dassault Mirage 2000 fourth-generation fighters, which are relatively similar to MiG-29s. The list of aircraft Pakistan can possibly set against its rival mostly includes older versions of the French Dassault Mirage aircraft series, such as Mirage 4 and Mirage 5. Developed back in 1960s, these aircraft were traditionally equipped mostly with various air-to-surface armaments, Khodarenok said. Apart from F-16s, which remain Pakistan’s most modern western-produced fighters, Islamabad also wields a large number of Chinese-made aircraft, although their types and characteristics are unknown. When it comes to air defense, both sides have little to boast about, the military analyst believes. Their air defense systems are relatively few in number and are far from the most-advanced weapons of our time. Islamabad possesses a Chinese equivalent of an old Soviet S-75 high-altitude air defense system, which is also known under its NATO reporting name SA-2 Guideline. Although, the exact specifications of the Chinese system are not known, its Soviet-made analogue was first produced back in 1957. In addition, it also has a French all-weather short-range anti-air missile, Crotale, produced since the late 1970s and still operated by France as well. New Delhi has its domestically produced Akash medium-range mobile surface-to-air missile defense system, which might fall short of Pakistan’s S-75 equivalent when it comes to range and flight ceiling. However, it also possess the Soviet-made S-125 Neva/Pechora (NATO reporting name SA-3 Goa), which has significantly longer range and higher flight ceiling than the French Crotale. However, both sides are unlikely to unleash their arsenals as neither are interested in escalating the conflict to an all-out war, Khodarenok said. New Delhi and Islamabad would likely limit themselves to some belligerent statements followed by an effort to ease the tensions, he concluded. AOC Rules Of Engagement makes Amazon Pulls Out Of Seattle Office Tower? As community activists in Virginia, emboldened by Alexandria Ocasio-Cortez’s successful campaign to drive Amazon out of Queens, push back against Amazon’s plan to build its HQ2 in Crystal City, it looks like Amazon is preemptively scaling back its plans to expand in Seattle as it braces for more pushback from progressives. According to a report published by GeekWire, which managed to obtain a copy of a marketing flier circulated by the company, Amazon is seeking to sublet 30 floors of office space in a new building in Rainer Square – which is still under construction. A marketing flier obtained by GeekWire confirms that the tech giant is seeking new tenants for its office space in Rainier Square, a building under construction that will one day be the city’s second-tallest skyscraper. Amazon had leased all 30 floors of office space in the building. After weeks of rumors, the listing was made official over the weekend, according to real estate brokers familiar with the marketing efforts. Amazon will make all of the office space it leased in Rainier Square available to other companies. Amazon’s decision to pull out of the tower, which comes after the Seattle City Council backed down from plans to impose a new headcount tax – intended to provide more resources for homelessness – after the company threatened not to move into Rainer Square, is “emblematic” of the company’s “uncertain future” in its hometown. Now, it appears Amazon is making good on that threat, despite having beat back the tax. The skyscraper project, once an emblem of Amazon’s ambitions in Seattle’s urban core, now becomes a symbol of its uncertain future in its hometown. The move follows Amazon’s decision to back out of its HQ2 project in New York City after opposition there, amid signs that the company will focus its Seattle-area growth in nearby Bellevue, Wash.
Amazon did not immediately respond to GeekWire’s request to comment on the news. Real estate company JLL is listing the space on the company’s behalf, according to the flier. A source told GeekWire that Apple, Oracle and Dropbox are all “circling”, and have expressed interest in renting space at the tower, which is located at 4th and Union Street. While Amazon’s motives in subleasing the space are unclear, it’s worth noting that several Seattle City Council members recently traveled to New York City to warn activists about the downside of hosting Amazon in your backyard. Rainier Square was at the center of a heated tax battle between Amazon and Seattle last year that became emblematic of the company’s troubled relationship with its hometown. As Seattle considered a tax on top-grossing businesses to fund affordable housing, Amazon threatened not to move into Rainier Square, claiming the City Council’s approach “forces us to question our growth here.” Although Amazon came out on top in that dispute, its future at Rainier Square remained uncertain. And in an ominous statement that sounds suspiciously like a warning, Amazon said it would “continue to evaluate future growth” once other projects underway in the city are finished. Amazon currently occupies 12 million square feet of office space in Seattle and has several additional projects under construction. The company will “continue to evaluate future growth” when those projects are finished, an Amazon spokesperson told GeekWire previously. From 2013 to 2017, Amazon scooped up at least 800,000 square feet of office space in Seattle every year, according to GeekWire research. But aside from confirming a pair of previously reported leases last year, Amazon hasn’t snapped up any additional office space in Seattle proper. But in neighboring Bellevue, Amazon is leasing more than 1 million square feet of office space and is rumored to be looking for a lot more. It’s likely that thousands of employees could have been situated in the office space that Amazon is now abandoning. Given that, it’s unlikely this decision was part of a routine reshuffling. Rather, it’s more likely that Amazon is trying to put its home town on notice: Don’t even think about trying to capitalize on the anti-Amazon sentiment that is currently in vogue among American progressives. The much-hyped “aid weekend” involving a US Trojan Horse fell at the first hurdle. Venezuelan government forces averted the provocation intended by US aid convoys from Colombia and Brazil. However, increasing frustration in Washington beckons more false flags. Something shocking is “needed” in order to jolt world opinion into acquiescing to Washington’s criminal agenda of “all options.” In the fiendish mind of American imperialism, it is also prudent to consider “all options” as meaning more than military aggression. The foulest moves. The torching of trucks purportedly ferrying US food and medicines across the border from Colombia was patently a planned provocation. Credible video footage and witnesses attested to the arson being carried out by supporters of the US-backed opposition figure Juan Guaido. The vehicles never even made it to the crossing point where Venezuelan national guards were deployed. It seems obvious the whole scenario of delivering US aid into Venezuela from neighboring countries was really intended as a pretext for military intervention by Washington. The government in Caracas had warned of such a contingency in advance, as had Russia, which is allied to President Maduro’s administration. Moscow’s experience in Syria has no doubt given a lot of valuable insights into the American playbook of using false flags for justifying military aggression. The timing of the Lima Group summit – 12 Latin American states along with the US and Canada – was meant to capitalize on the false-flag incident over aid, as well as other deadly clashes at the weekend that resulted in dozens of casualties. However, the provocation did not go to plan, despite Pence and Guaido’s grandstanding assertions. The other downside for the US regime-change objective in Venezuela is that the Lima Group has for the moment broken ranks over the military option. Pence and Guaido stepped up the rhetoric calling for “all options” on the table – meaning military intervention. But the Lima Group, including US allies Colombia, Brazil, Argentina and Paraguay, issued a statement after the summit Monday rejecting any military action. They are still functioning as lackeys by calling for a “peaceful transition to democracy” and are in favor of the dubious US-anointed opposition figure Guaido, recognizing him as the “interim president” of Venezuela, in accordance with Washington’s desires. Nevertheless, repudiation of the military option by Washington’s regional allies will be seen as a damper to the momentum for using American force to overthrow the Maduro government. Brazil’s Vice President Hamilton Mourão repeatedly said in interviews that his government would not allow a US military incursion into Venezuela from its territory. The European Union also said it was opposed to any military force being used by the US against Venezuela. The emerging situation therefore puts the regime-change planners in Washington in a quandary. Their sanctions pressure for blackmailing defections in the Venezuelan political and military leadership has failed. So too has the much-vaunted spectacle of delivering US aid. Growing frustration on the US side was evident from the obscene posting of “snuff movies” by Florida Senator Marco Rubio, comparing the bloody fate of former Libyan leader Muammar Gaddafi with what might happen to Maduro. Rubio has become something of an unofficial envoy for regime change in Venezuela on behalf of the Trump administration, in the same way the late Senator John McCain performed his role in helping prompt a coup d’état in Ukraine back in 2014. As well as conveying death threats to Maduro concerning Gaddafi, who was brutally lynched by NATO-backed jihadists in October 2011, Rubio also posted images of former Panamanian leader Manuel Noriega. Noriega was captured by US forces after they bombed and invaded his country in 1989. The criminality of Rubio and other senior US officials, including President Trump, openly calling for regime change against Maduro is a sign of how manic Washington has become in getting its hands on the country’s vast oil wealth. There isn’t even a hint of coyness about the criminality. Therefore, it can be anticipated, Washington needs a game-changing event – badly – in order to shift its lackey Lima Group, the EU and the United Nations to accepting its agenda for a military option. UN Secretary-General Antonio Guterres has strongly appealed for no violence in the stand-off between the US and Venezuela. Significantly, the UN has declined to get involved in delivering US aid to the South American country, as such involvement would be viewed as taking sides. Ominously, the Lima Group has issued a statement claiming to have credible evidence that Juan Guaido’s life is seriously threatened by Venezuelan state security. Pence also warned that Maduro would be held responsible for Guaido and his family’s safety. Last month, Guaido made claims that his wife’s family was menaced by state agents who allegedly visited their home. It was an unconfirmed claim, which the Venezuelan authorities denied. Guaido defied a travel ban to attend the summit in Bogota earlier this week. It is not clear if he will return to Venezuela as he is liable to be arrested on charges of inciting sedition and civil unrest. Indeed, Washington’s game plan does not seem to be going well. Through a series of miscalculations and foolish over-reach, the gambit in Venezuela is at risk of becoming a debacle. That very situation, however, could tempt a desperate throw of the dice by the Trump administration to salvage its losses so far. A major, shocking event is needed, it may be calculated, in order to get the Latin American and European lackeys into line on regime-change policy, specifically the military option. As the Brookings Institute pundit said, “to get the United Nations on board.” Because so far, the majority of the UN members, including Russia and China, key UN Security Council veto powers, are not complying with Washington’s dictate of delegitimizing President Maduro and recognizing the US-backed puppet figure Guaido. What could such a shocking event entail? Somebody is telling the Lima Group that Guaido and his family are in grave danger of being assassinated. Guaido’s Popular Will party is known to engage in violent subversion and allegedly has links to the American CIA, as reported by Abby Martin and others. Vermont Senator Bernie Sanders appeared at a CNN town hall on Monday night as part of his second presidential bid. He answered voters’ questions on his proposed wealth tax, high college costs, drug prices, foreign interference in US election and other matters. At the end of the town hall event, CNN moderator Wolf Blitzer thanked the questioners, but the background of some people from the audience raised eyebrows. One audience member, Shadi Nasab, was introduced as a student of American University. She asked Sanders a question on allegations of sexual violence and harassment brought against his staffers during the 2016 campaign. Paste Magazine found out that Shadi, according to her LinkedIn bio, is an intern at Cassidy and Associates, a major DC lobbying firm. Further on, CNN called Tara Ebersole, who asked Sanders about his Medicare-for-all plan, a “former biology professor”, whereas she can be found on LinkedIn as chair of the Baltimore County Democratic Party. Abena McAllister, who asked a question about the necessity of public preschool for all, was described as “an active Democrat'”. However, it appears that CNN has done a little research into her background, as Abena serves as deputy secretary of the Maryland Democratic Party and previously chaired the Charles County Democratic Central Committee. Another person, Yunjung Seo, was introduced as a political science student at George Washington University, but perhaps more importantly, she also works for fundraising and consulting firm Katz Watson Group. Michelle Gregory was simply called a “Maryland voter”, but it appears that she had run for a seat on a county council in Maryland in the latest midterms. She also happens to be the communications chair of the Lower Shore Progressive Caucus on Maryland’s East Shore, according to the Baltimore Sun. The Paste Magazine concedes that the questions they asked might not have been particularly tough or unfair, but the mere fact that these details hadn’t been disclosed raises questions as to what CNN’s intentions were. Today’s border clashes between India & Pakistan near Sialkot resulted in the deaths of between 19-24 Indian soldiers, 8 Pakistani soldiers, and 4 Pakistani civilians, according to some reports. Pakistan also claimed they shot down two Indian aircraft in self-defense which crashed on both sides of the LOC, and have since released video footage of a captured IAF pilot, Wing Commander Abhinandan Varthaman, who was flying an MiG-21 for some reason (India has Sukhois, and yet they send a Soviet “antique”), which in turn India claims shot down a Pakistani plane but there’s no evidence of that. India’s other downed aircraft was an Mi-17 helicopter, killing 1 civilian, and 4 IAF personnel. Yesterday the Indian media began talking up how much damage it had inflicted across the LOC, with anonymous government sources being repeated by the Indian media claiming the IAF took out “300 terrorists”, although the Foreign Secretary Vijay Gokhale would only go so far as to claim a “large number” were killed, whereas on the Pakistani side, they claimed they sustained “no casualties” at all. In my view, India has in the past fought defensive and just wars against Pakistan, on three occasions to defend the territorial integrity of Jammu & Kashmir (J&K) which acceded to India in 1947, and more famously to liberate Bangladesh in 1971, but to me it feels like this is the first time Pakistan is not acting like they’re itching for a fight. On the Indian side, PM Narendra Modi is on the campaign trail saying that he “will not let the country bow down”, that he wants to “pay homage to India’s bravehearts”, and assured everyone that “the country is in safe hands”, whereas by contrast, Pakistani PM Imran Khan is saying, “let us open the corridor of negotiations and settle all outstanding issues”, “if India wants to hold a dialogue, we are ready”, “it is not in Pakistan’s interests to go to war”, and “let sanity prevail”. Sure, first there was the Feb 14 suicide bombing killing 44 Indian soldiers in Pulwama J&K, carried out by the Pakistan-based Jaish-e-Mohammed terrorist organisation, which Imran Khan did not condemn in all likelihood because doing so is politically costly given the importance of Kashmir to Pakistan’s very identity almost, but the question is whether India’s actions are being motivated purely by a desire to neutralise the Kashmiri insurgency, or whether it’s “for the personal glorification of Narendra Modi”? Those aren’t the words of Arundhati Roy by the way, that’s Rajiv Tyagi, a former pilot of the Indian Airforce whose article berating the Modi government for the way they’ve handled this is well worth the read (see link). Could coconut oil help mitigate the effects of Alzheimer’s disease? Some research has indicated that it very well could be a natural way to boost cognition, and possibly even reverse the effects of this dreaded disease. Alzheimer’s disease is currently the most common form of dementia across the globe, and there is no currently recognized cure for the condition. As the world’s population continues to grow older, the number of people affected by Alzheimer’s will likely continue to grow, too. People with Alzheimer’s disease are no longer able to use glucose as well as they once did. In return, brain size decreases over time. One of the primary suspects in cognitive decline is the process of decreased brain metabolism. Current estimates suggest that more than five million Americans alone are living with Alzheimer’s disease, and about one in three senior citizens will die with some form of dementia. It is expected that nearly 14 million people will be afflicted with Alzheimer’s disease by the year 2050 — barring some kind of medical breakthrough. While the mainstream medical community may be thinking that they need to come up with some newfangled medication to stop Alzheimer’s disease, it seems quite possible that the way to prevent and reverse Alzheimer’s disease can be found at your grocery store. A recent study has shown that coconut oil could offer an array of benefits to people suffering from this heart-wrenching condition. To conduct their research, the Spanish scientists gathered participants and split them into two groups: an intervention group that received the coconut oil, and a control group. Cognitive function evaluations were conducted prior to the study’s onset and again at its conclusion. The intervention group received 40 mL of extra virgin coconut oil every day. 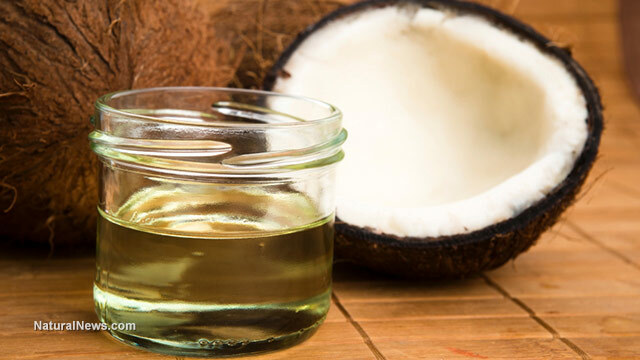 At the conclusion, the team found that people who took the coconut oil demonstrated a statistically significant improvement in their cognitive function. The researchers noted that the participants who were female, who did not have Type 2 diabetes or were diagnosed with more severe cognitive decline, seemed to exhibit the highest level of improvement, which suggests that the total benefits of coconut oil may be at least somewhat dependent on other factors. A a randomized double-blind, placebo-controlled study of coconut oil’s potential role in Alzheimer’s treatment has also been conducted by the USF Health Byrd Alzheimer Institute. The study began in 2013 and concluded in December 2016. One of the defining features of Alzheimer’s disease is reduced glucose metabolism in the brain. Glucose is the brain’s primary source of fuel, but there is an alternative: ketones. When your body breaks down stored fat into usable energy, your body (and your brain) are running on ketones. This “back-up” process has sparked researchers’ interest; many wonder if supplementing with extra ketones may help to relieve, or even reverse, the affects of Alzheimer’s disease. So, it would seem that the potential for coconut oil to help mediate the effects of Alzheimer’s disease are very much real. Hopefully, the government won’t try to make that a Schedule I substance, too. 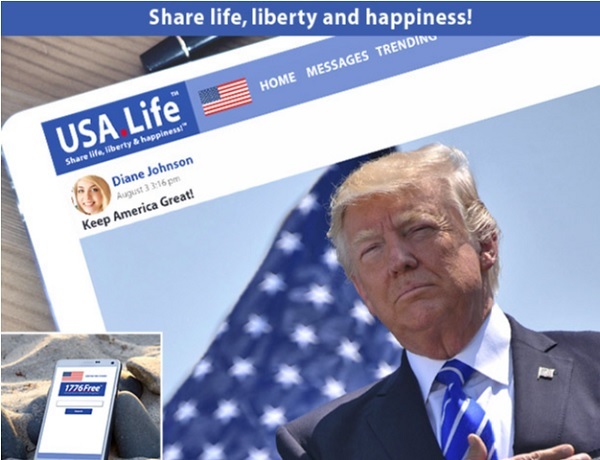 Describing itself as the “answer to Facebook and Twitter censoring Christians, conservatives and liberty,” a new social-media platform called USA.Life will officially launch Wednesday. Founder and CEO Steven Andrew said he decided to use his Silicon Valley tech leadership experience to launch the project after he saw Facebook block millions of people from getting his posts. Andrew believes Facebook lied to Congress about being “a platform for all ideas,” since they restrict President Trump supporters, Christians and conservatives. “We don’t have the billions of dollars Facebook, Google and Twitter have, so we need people who want freedom and privacy to contribute what they can,” he said. “The USA.Life and 1776Free.com are needed to protect the free speech assured by the First Amendment. We will unite the nation,” Andrew said.